Over at the First Thoughts blog, Mark Movsesian offers a brief note on the question of whether Abraham Lincoln was a Christian, or even claimed a religious affiliation at all. Prof. GUELZO: . . . Many religious people, many Christian believers who read this book experience a sense of disappointment, because they may have read in a number of other places or heard from a number of other quarters that Abraham Lincoln was a Christian. Well, the truth of the matter is that, no, he was not. He was exposed to Christian influences all through his life. He knew Christian people. He worked with Christian people, worked with Christian ideas. But Lincoln never joined a church, never was actively involved in any kind of Christian organization; in fact, really had only the most minimal religious profile in his own day. What has happened, though, is that after Lincoln’s death, there was no shortage of people who wanted to claim Lincoln as being one of their own. They could do this because Lincoln was a very private person. He was often described as being shut-mouthed and reticent, and he really was. He did not like to talk about himself or his inner life. His law partner, Herndon, who knew him probably as well as anybody could know someone not being part of the immediate family—Herndon said of Lincoln that Lincoln kept half of himself secret, away from the general public, and then he kept half of what was left even from his closest friends. People have rushed into that vacuum and tried to suggest, well, Lincoln was really heading in this direction or Lincoln made some kind of secret statement about this direction. There was a very famous story that suggests that Lincoln was about to join the New York Avenue Presbyterian Church on Easter Sunday 1865. Prof. GUELZO: In—right here in Washington. And, of course, he’s assassinated on Good Friday. And the line of reasoning is that had not Lincoln been shot, he would have joined. He would have made a public Christian association of himself with the New York Avenue Presbyterian Church the following Sunday. It’s a very famous story. I’ve bumped into it any number of times, and there is not a single shred of evidence that it’s true. LAMB: You say he was a deist? Prof. GUELZO: He was something close to a deist. Prof. GUELZO: He believed in a very general sense that there was a God, or at least there was a force that gave order and shape and predictability to the world and to the universe. But he would not move beyond anything more than that, anything more explicit than that. He believed there was some kind of God. But whether this God was a personal God, whether this God gave active direction and intervention to human affairs, that was a subject which, over years, he tended to shift his position on a good deal. LAMB: I’m going to mention different things that you write about and–and just tell us what impact they had on his life. The Baptists. Prof. GUELZO: Well, he was born into a Baptist family—in fact, a Baptist group who were very sectarian, very come-outerish. They were radical predestinarians. In other words, they believed that God ordained every event, whatever comes to pass. For that reason, this particular Baptist group, sometimes known as the Separate Baptists, would not sponsor missionaries. If the heathen were going to be converted, God would do it. You did not put yourself into a place where you were going to accomplish it. They did not have a professional paid clergy. They did not have Sunday schools. They even frowned on involvement in reform movements. 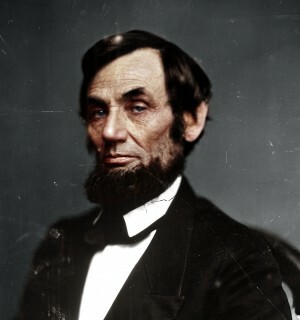 Lincoln grows up in that environment, and, in fact, he is so good at understanding that environment that, in his youth, he would get on top of tree stumps and deliver sermons that he had heard from the Sunday previous almost word for word, because his memory was so good. But this was acting; this was not being part of something. He never joined a Baptist church, never committed himself to a religious organization that way. Prof. GUELZO: The Methodists he knew because so many of the Methodists were so aggressive on the frontier in building churches, and sometimes not only building churches, but building public profile. One of his most famous political opponents in Illinois was a Methodist circuit-riding preacher, Peter Cartwright, and it was Cartwright, first of all, who was his opponent for the congressional seat that he ran for in the 1840s. Cartwright was running as a Democrat; Lincoln as a Whig. But Cartwright also started what Lincoln called a whispering campaign through the Seventh Electoral District, which suggested that people should not vote for this man, Lincoln, because he was an unbeliever and an infidel and, therefore, could not be trusted. Prof. GUELZO: He came to Springfield in 1837, and for many years did not associate himself with a church. In fact, he wrote back to New Salem at one point saying that he’d been in Springfield now this period of time and hadn’t gone to church because he was afraid he wouldn’t know how to behave there. I think that there’s some truth to his statement about his anxiety about behavior, but I think lying behind that is the fact that he really did not have anything in the way of religious beliefs. In fact, people who knew him in those early years in Springfield said that he would gather around him a number of his friends and he would take up the Bible and he would read parts of it aloud and criticize it, scoff at it, say that this couldn’t possibly be true, sometimes to the point where a number of his friends thought he was an atheist. When he married Mary Todd, she was kind of religiously chilly herself, and for a number of years, neither of them went to church. But then in 1850, Lincoln’s second oldest son, Edward, dies and this provokes a crisis in the Lincoln household. It’s a crisis that is met by the pastor of the First Presbyterian Church in Springfield, a Scotsman named James Smith. He ministers to Mary Todd and has a very effective ministry to her, counseling her in her bereavement, and Lincoln goes to him–to Smith–with his perplexity, his questions. `Why did God take my son? I’m perplexed about predestination and providence.’ And from that point on, the Lincoln family affiliates with the First Presbyterian Church and Lincoln rents a pew there. He doesn’t join the church. In fact, sometimes he doesn’t even come, but he does take this step of associating his family, if not himself personally, with the First Presbyterian Church. And he comes to like First Presbyterian because among the Presbyterian Churches, First Presbyterian is an old school church. It’s an old school church meaning that it was very loyal to the old traditional standard teachings about predestination. It was a very Calvinist church. And not only will Lincoln feel comfortable with that, because he is a fatalist, but when he comes to Washington as president, the church that he will affiliate his family with here, the New York Avenue Presbyterian Church, is also an old school Presbyterian Church. If he is going to feel comfortable with any kind of formal religion, it will be the old school Presbyterians.